Alan T. has made an awesome LISP routine called BRE.lsp to accomplish just that. Select the block that you want to replace the other selected blocks. This entry was posted in AutoLISP, AutoLISP: Blocks, AutoLISP: Modify, Blocks, Modifying. Bookmark the permalink. What an excellent tool, thank you, i have been looking for a way to do this for a while. This looks like a pretty useful tool. 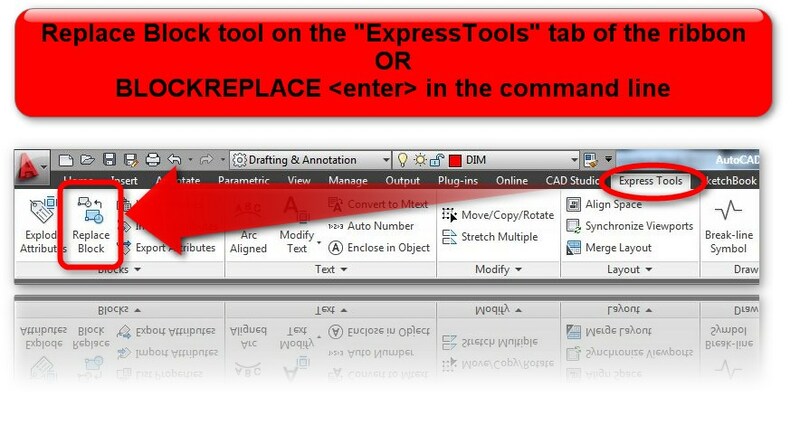 Unfortunately I have the AutoCad 2013 which does not have access to express tools. Is there another way I can block-replace or can I download Express Tools anywhere? The LISP routine at the bottom of the post should work just fine if you have full AutoCAD. Do you happen to have AutoCAD LT? this will not have the Express tools and it will not use LISP routines as well. If you have full AutoCAD, the following link shows how to load them. How can you use scale and rotation of the new block? Thanks SO much for your help. I have now got this routine working for me. It does scale as you say but that shouldn’t matter for what I want it for. HOURS saved! You are very welcome! I was just sharing what another Caddie figured out! I am glad the routine was useful for you! It definitely saved me a ton of time.. NO I in TEAM!!! I am always happy to help the CAD community which as always given me so much assistance! Is there a way to keep the attributes just like if I were to replace a block globally? With this routine I lose all attributes and have to retype everything in. Here is a link to a routine that is free called RIblock.vlx. I tried to find an open-source lisp version for you but I cannot find one. This one works great and does what you need. The file format “.vlx” is a compiled lisp code. You still load it the same way as a lisp routine. I usually don’t touch compiled code because people have been abusing its hidden nature, but the programs found at http://www.cadstudio.cz are quality routines. I have full version of AutoCAD 2014. Would you know what am I doing wrong? I saved mine in notepad first. The loaded it with the Visual Lisp editor then I created the lisp file from that. Did you copy/add everything to the lisp file. Even all of the parentheses? Yes it works perfectly!!! You are the greatest! Autodesks needs to add this to the product!!! Please let me know if you can help because this is great and I want to be able to use this lisp. (strcat "\nSpecify new fillet radius <Current="
Looks like that did the trick. Please read the post below. This routine works great.. I found a lisp routine that works like a charm.. its called BRE. Enjoy! What an awesome tool! Saved me MANY hours of tedious manual work. Thanks so much! Awesome – that’s why I love scripts and Lisps so much. They make tedious tasks simple. This would be a life saver if I could get this to work. I’ve tried loading and using it but when I select the blocks I want to replace they just disappear?? What am I doing wrong? Ar great. Yes this is similar to what I’m doing. I work in Illustrator to start with and then bring the artwork into CAD to detail up for construction. When you bring Symbols (Illustrator’s version of Blocks) in from Illustrator CAD annoyingly gives each symbol a separate definition Block 1, Block 2 etc. I’m using BRE to select all these separate definitions of essentially the same block and redefine them as one block/one name. I’ll certainly get in contact if I need any more help, thanks…you’ve been great. I used this BRE.lsp and it works fairly well. I am impressed with the functionality. I do have two small requests that may be beneficial to everyone. When replacing the block, it seems that a new object is created because any dynamic fields (tables or labels) that I had pointing to the original block are broken when I use the BRE command. Also, attribute data is lost when replacing with new block. Would you please consider rewriting this LISP to allow for maintaining the same entity/object name and also preserve attribute data from the old block? Thank you for considering my request. BRE is a Great Command! Saved me tons of time changing and replace large numbers of blocks. I use it in conjunction with the filter command. Especially when working with Revit exported files. I think the lsp file worked, however, rather than replacing my block, it deleted the existing block… how do I change this? I am brand new to Auto Lisp. Here are some others to check out instead of the one posted on my site. does any have this for Mac?